Police recovered a huge cache of guns and explosives Monday from the Las Vegas hotel room and home of the man accused of killing at least 59 people and injuring over 500 in the deadliest mass shooting in US history. US officials reacted cautiously meanwhile to an Islamic State claim that Stephen Craig Paddock, 64, had carried out Sunday night's massacre on the Las Vegas Strip on behalf of the jihadist group. Police said Paddock, a retired accountant with no criminal record, smashed windows in his 32nd floor hotel room shortly after 10:00 pm and trained bursts of automatic weapons fire on thousands of people attending a country music concert below. Investigators recovered at least 16 guns, including assault rifles, from Paddock's room at the Mandalay Bay hotel, and another 18 firearms along with bomb-making materials at one of his two homes. Country music star Jason Aldean rushed off stage when the shooting began, and concert-goers scattered in panic, frantically seeking cover as bullets rained down from above. "We saw bodies down. We didn't know if they had fallen or had been shot," said Ralph Rodriguez, an IT consultant from the Pomona Valley, near Los Angeles, who was at the concert with a group of friends. "People started grabbing their loved-ones and just strangers, and trying to help them get out of the way," Rodriguez said. The Islamic State group claimed that Paddock was one of its "soldiers" but the FBI said it had found no such connection so far and the local sheriff described him as a lone "psychopath." Police said Paddock killed himself before a SWAT team breached his hotel room overlooking the country music venue. Sheriff Joseph Lombardo said a security guard was shot in the leg as officers stormed the room where Paddock had been staying since September 28. 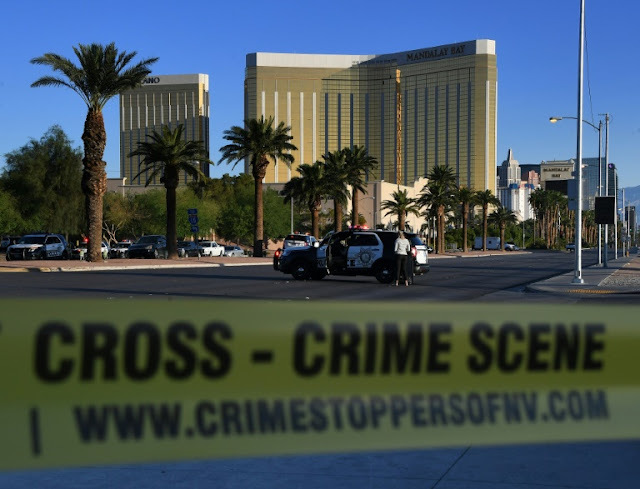 He said a search of Paddock's house in Mesquite, Nevada, 80 miles (130 kilometers) northeast of Las Vegas, recovered "in excess of 18 additional firearms, some explosives and several thousand rounds of ammo." Lombardo said investigators had discovered several pounds of an explosive called tannerite in the Mesquite home, as well as ammonium nitrate, a type of fertilizer, in the gunman's car. The sheriff said the death toll had risen to 59, while 527 people had been injured. Lombardo said the authorities had found no manifesto or anything else to explain Paddock's actions. "This individual is a lone wolf and I don't know how it could have been prevented," he said. "I can't get into the mind of a psychopath at this point." President Donald Trump denounced what he called "an act of pure evil" and said he would visit Las Vegas on Wednesday. But the White House pushed back at calls to reopen the US debate on tighter gun controls. "A motive is yet to be determined and it would be premature for us to discuss policy when we don't fully know all of the facts or what took place last night," Trump's spokeswoman Sarah Sanders said. Lombardo said Paddock had apparently used some kind of hammer to smash the window of his hotel room before opening fire on the concert crowd of some 22,000 people. IS described him as a "soldier of the caliphate," saying he converted to Islam several months ago and went by the nom de guerre Abu Abdel Bar al-Amriki -- "The American." The group provided no evidence to back up its claims and the Federal Bureau of Investigation said it had found no such link so far. "We have determined to this point no connection with an international terrorist group," FBI special agent Aaron Rouse said. CIA spokesman Jonathan Liu said "the Intelligence Community is aware of the claim of responsibility by a foreign terrorist organization." "We advise caution on jumping to conclusions before the facts are in," Liu said. Paddock, according to his brother, was a high-stakes gambler and their bank-robber father was once on the FBI's 10 Most Wanted list. But Eric Paddock stressed that his brother led an otherwise normal life, doting on their mother. "He liked to play video poker. He went on cruises. He sent his mother cookies," he said. "We're trying to understand what happened," his brother said. "We're lost." Paddock had "no religious affiliation, no political affiliation" and was "not an avid gun guy at all," his brother added. Paddock's girlfriend, a 62-year-old Asian woman named Marilou Danley, was out of the country at the time of the shooting. Lombardo said she had been located in Tokyo, and would be questioned upon her return. Witnesses said Paddock opened fire with an initial long burst of gunfire, and appeared to reload as he continued his spree. Robert Hayes, a Los Angeles firefighter who was at the concert, said he first thought the shots were some kind of equipment malfunction. "It was pretty much like a war scene inside," Hayes said, as emergency crews used tables and metal guard railings as makeshift stretchers. It was also the latest in a series of deadly attacks at concert venues. Twenty-two people were killed after an Ariana Grande concert in Manchester, England in May when a suicide bomber detonated a nail bomb in the foyer. Ninety people were killed in November 2015 at the Bataclan in Paris during a concert by US band the Eagles of Death Metal. Pope Francis said he was "deeply saddened" by the "senseless tragedy" in Las Vegas, Britain's Queen Elizabeth II offered her "thoughts and prayers" and Russian President Vladimir Putin wrote Trump to voice condolences over the "shocking" crime. 0 Response to "Weapons, explosives recovered from Las Vegas gunman"